AMI Environmental Indoor Air Quality Quiz: How much do you know about IAQ? 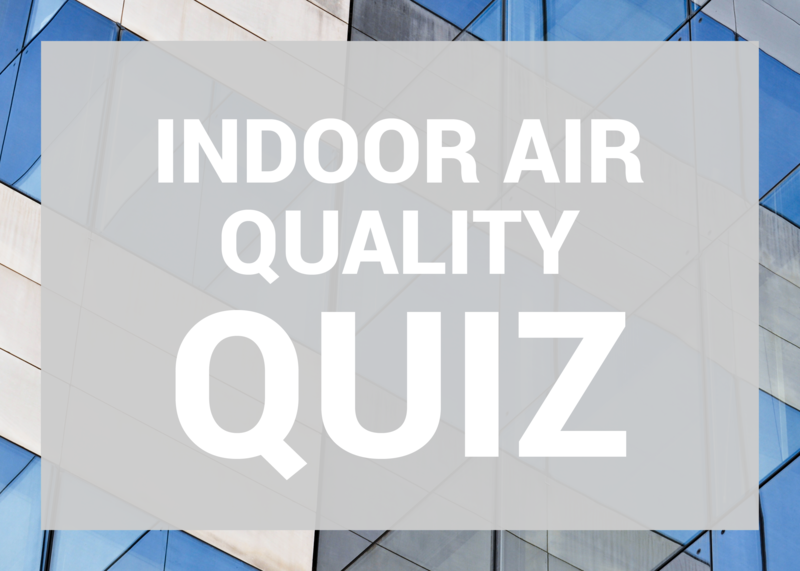 Take our IAQ Quiz to find out how much you know about the air you breathe, and how you can improve IAQ where you live, work and play. 1. How much money does Sick Building Syndrome cost businesses each year? 2. Which of the following does NOT describe Building-Related Illness (BRI)? Symptoms improve rapidly after leaving the suspected building environment. Symptoms include coughing, chest tightness, fevers, chills and muscle aches that. BRI symptoms have been clinically defined. Specific treatment can be prescribed for these illnesses. 3. Good indoor air quality requires which of the following? Temperature – Maintained at comfortable levels for occupant activities. Humidity – The amount of moisture in the air responsible for “dry” or “stuffy”. Indoor Air Pollutants – Monitored and controlled to maintain occupant health and comfort. 4. How quickly can mold start to grow after a water event? 5. True or False: Sick Building Syndrome (SBS) can be diagnosed by a doctor. 6.Which product category is least likely to contain formaldehyde? 7. True or False: You will notice any water event serious enough to cause mold growth. 8. True or False: Old buildings are more likely to encourage mold growth. 9. What percentage of people suffer from allergies? 10. Which of the following products is best for improving Indoor Air Quality? 11. True or False: Indoor air is cleaner than outdoor air. 12. During which season(s) do we receive the most Indoor Air Quality complaints? 13. Which of the following elements contribute to poor IAQ? 14. Which chemical is responsible for the “fresh new” smell you experience in new cars, homes and buildings? 15. How does poor IAQ affect children in school? Answer Sheet: How did you do? 1. How much money Sick Building Syndrome cost businesses each year? Lost productivity is one of the hidden costs of poor Indoor Air Quality; and a major cost at that! According to the Environmental Advisory Council, Sick Building Syndrome cost businesses $200 billion in lost worker performance annually due to decreased productivity and sick days. Indoor air pollution is thought to cost another $60 billion annually. In contrast, “green” buildings designed to meet Leadership in Energy and Environmental Design (LEED) guidelines, have an average of 5% less sick time than in traditional office buildings, as well as an average 15% increase in worker productivity. BRI symptoms do not improve for a prolonged period after leaving the suspected building environment. This is one of the key differences between Building-Related Illness and Sick Building Syndrome. If you guessed all of the above, you are correct! Good indoor air quality requires that all four IAQ factors be kept in balance for optimal occupant health and comfort. Learn more about the four factors that determine IAQ here. Mold can start to grow within hours—not days. If you do discover a water event in your building, make sure you clean and dry affected materials within 48 hours to prevent mold growth. Sick Building Syndrome (SBS) does not have a clinically-recognized set of symptoms. Occupants suffering from SBS have reported a range of symptoms including eye, nose and throat irritation; dry cough irritated skin; headaches, dizziness and nausea; trouble concentrating and fatigue. Usually, SBS symptoms appear and intensify while occupants are in the building, and quickly dissipate after leaving the building. 6. Which product category is least likely to contain formaldehyde? One of the biggest challenges in reducing formaldehyde-associated risks is identifying which products are made with formaldehyde in the first place. Composite wood materials (like plywood, chipboard, etc.) commonly contain formaldehyde-based adhesives and are used to make doors, cabinets, wall paneling and engineered wood flooring. But formaldehyde-based adhesives aren’t just limited to wood products. They can also be found in foam insulation, laminating adhesives, paints, coatings, sealants, upholstery and carpeting. These products will go through a process called “off-gassing” where formaldehyde is steadily emitted from the products. A water event can be anything from a serious flood to water intrusion to excess humidity that causes moisture to build up inside walls and under carpets. Learn about about mold and moisture problems and the dangers of hidden mold. There’s a rumor going around that mold growth is not a concern in new buildings—and that’s just not true. While older buildings certainly face mold issues, newer building construction is oftentimes more likely to encourage mold growth. Newer buildings have been equipped with more effective building envelopes to help improve energy efficiency and protect against outdoor air pollutants. The result is that new buildings are sometimes too well insulated and HVAC systems are still not always able to provide enough ventilation and filtration to control pollutants in indoor air. This imbalance can easily lead to a situation where moisture vapor becomes trapped in walls and creates an environment for mold growth. Here’s some additional info on building envelope design for healthy IAQ. While bad smells can certainly ruin perceived IAQ, odors are almost always less harmful that the products we use to make our spaces smell better. Air fresheners don’t actually freshen indoor air at all. Instead, they add phthalates to the air, which are known to intensify asthma symptoms, interfere with reproductive development, and disrupt hormone function in babies and children. Candles emit chemicals like benzene, toluene, alkanes and alkenes; natural soy- or beeswax-based candles made with only pure essential oils are the way to go. Many household cleaners contain Volatile Organic Compounds (VOCs) that are emitted during both use and storage. Children, elderly adults, and people with asthma or other respiratory problems are most at risk for complications due to VOC exposure. Does this come as a surprise to you? Here are 12 Things You Didn’t Know About IAQ. According to the Environmental Protection Agency (EPA), indoor environments have 2 to 5 times more pollutants than outdoor environments. In extreme cases, indoor pollutants have been recorded at levels 100 times higher. Combine all that indoor air pollution and with the fact that we spend 90 percent of our time inside and it’s no surprise that the EPA has ranked poor IAQ among the top five environmental health risks. These seasons are notorious for outdoor allergies, but we also see a lot of issues arise indoors for a different reason: building systems are switching from heat to cooling in springtime, and vice versa in the fall. When building systems “switch over” air ducts that have not been used or cleaned in many months are suddenly pushing dusty air into our living spaces. This is an easy one because none of the elements above sound ideal for healthy IAQ. Just remember this: it’s easy to forget just how many factors contribute to indoor air pollution. Every day, products and processes are contributing to our indoor air for better or for worse. Because children’s bodies are still growing and developing, they are at a greater risk for developing health problems when exposed to environmental and chemical hazards. Resulting health problems and uncomfortable learning environments can in turn affect students’ ability to concentrate and learn in the classroom. In the short-term, exposure to harmful substances throughout the school day can lead to temporary health issues like eye, nose and throat irritation; fatigue; and headaches, or to more serious health problems, like asthma. Regular exposure has also been found to cause serious long-term health effects, including cancer and damage to the liver, kidneys, and respiratory and nervous systems, among others. Furthermore, exposure to environmental hazards can have a significant impact on students’ education by decreasing their attendance, ability to focus, and overall performance in the classroom. Learn more about IAQ in schools here. Questions? Contact us at info@amienvironmental.com or at 800.828.8487.